Picking up where she left off in Where the Blind Horse Sings, Kathy Stevens regales us with more tales of the rescued animals at Catskill Animal Sanctuary (CAS)—some touching, some hilarious, all provocative. We meet Barbie; the broiler hen found hiding under a blue Honda in Brooklyn who falls for the animal ambassador Rambo, a ram with an uncanny sense of what others need. Then there’s Norma Rae, the turkey rescued from a “turkey bowl” just before Thanksgiving. There’s also Noah, a twenty-one-year-old stallion, starved and locked in a dark stall for his entire life until he came to CAS. Claude, the giant pink free-range pig, is but another of the “underfoot family,” those who roam the barnyard, free and with dignity, interacting with their own and other species in startling and profound ways. The love Stevens has for these animals, and the amount of love they give her in return is stunning and will make any reader more thoughtful of how we treat animals in this country. Pigs, cows, chickens, turkeys, horses, goats, sheep, and more, march into CAS and our hearts as we learn about their personalities and what makes us human. Kathy Stevens co-founded Catskill Animal Sanctuary, where her love of teaching, her belief that education has the power to transform, and her love of animals come together. 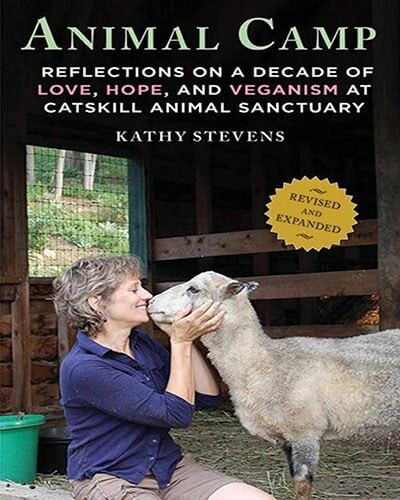 Kathy is the author of Where the Blind Horse Sings and Animal Camp, two critically and popularly-acclaimed books about the work of Catskill, and a frequent contributor to books, podcasts, and articles on animal sentience, animal rights, and veganism. She takes her message of kindness to all beings and the urgent imperative of veganism to conferences and colleges in the US and Canada. Kathy lives on the grounds of Catskill in Saugerties, New York, with her dogs Chumbley and Scout, and kisses many critters every day.